The City of Graham Police Department is committed to making a positive difference in the lives of our citizens through professionally supported and trained police officers. Officers strive to provide an environment that will allow citizens to live and work in a safe and secure community. You may visit City Hall at 9659 Golden Isle W. Graham, GA 31513 between the hours of 8:30AM and 4:30PM Monday through Friday. If you are from out of town you may call us at (912) 367-6900. There is a $5.00 charge for all copies of police reports. Minor traffic accident reports may be purchased online through www.buycrash.com The Georgia State Patrol investigates all serious (injury/fatality) traffic accidents that occur within the City of Graham. Please contact the State Patrol at (912) 557-7778 for copies of those reports. The Appling County Sheriff's Office also has law enforcement jurisdiction in our city. If a Sheriff's Deputy took the report, it may be obtained by calling (912) 367-8120. How can I report crime, speeding, or other problems in my neighborhood? If the problem is an emergency, please call 911. Otherwise, you may report any non-emergency to the police department 24/7, 365 days per year by calling (912) 367-6900 or you may report a non-emergency by e-mail at Chief of Police. You do not have to leave your name. How do I file a complaint or commend a Police Officer? We are interested to know if you are dissatisfied with the level of service we have provided. We strive to maintain a high level of professionalism at all times and we take your concerns very seriously. We will investigate your complaint and notify you of the outcome if you provide us with contact information. To file a formal complaint please stop by City Hall, call us at (912) 367-6900, or you may e-mail the Chief. You do not have to provide your name. To commend an Officer you may follow the same process. You may also share your feedback with us through our community survey by clicking here. A complaint regarding the validity of a traffic violation should be directed to the Municipal Court Judge for adjudication. A complaint regarding a Sheriff's Deputy, State Trooper, Game Warden, or other Federal, State, or local law enforcement official acting within the boundaries of the City of Graham, should be directed to their respective agencies. How do I apply for employment with the Police Department? To apply online click here. You may also send us a complete resume by e-mail or fax at (912) 367-5000. Click here for Sergeant position description. Click here for Police Officer position description. Volunteer positions are also available for those interested in helping out. We also offer ride-alongs to residents of Graham, Police applicants, and those enrolled in Georgia Law Enforcement Basic Mandate School. A waiver of liability form is required. How do I join a Neighborhood Watch? For more information on participating in our Neighborhood Watch program, please call (912) 367-6900 or email the Chief. You may pay online at www.grahampayments.com or mail payment to: 9659 Golden Isle W. Graham, GA 31513 (check payable to Graham Police Department) or you may pay in person, Monday through Friday between the hours of 8:30AM and 4:30PM at 9659 Golden Isle W. Graham, GA 31513. You can also pay by phone at 1-844-847-1744. For the fine amount please click here. Does the police department provide the public with data regarding how many citations are issued each month? The Graham Police Department will publish traffic stop data collection information on this website each month. This data includes information on number of traffic stops, warnings and citations issued, speeding citations, and demographic of violators. To view the data please click on the data collection link to the left. What is the police department's policy on biased-based policing and excessive force? The Graham Police Department prohibits biased-based policing and the use of excessive force by our Police Officers. To review our biased-based policing policy please click here. The Police Department utilizes body and vehicle cameras to record police-citizen interactions. Use of force incidents that result in death or serious bodily injury are referred to the Georgia Bureau of Investigation. Why was I issued a citation and not a warning? Law Enforcement Officers have a difficult job. One responsibility of a Police Officer is to detect unsafe driving on Georgia roadways. Traffic Accidents take far too many lives. In 2015, 1,427 people were killed on Georgia roadways. Traffic Enforcement helps to reduce traffic accidents and fatalities. It also facilitates the orderly flow of traffic through the city and frequently results in the arrest of wanted criminals, impaired drivers, and drivers transporting illegal drugs, guns, etc. Our Officers prefer to issue verbal warnings when appropriate and our enforcement statistics clearly reflect that. However, our Officers will cite drivers who commit dangerous traffic violations and whose driving behavior indicates a clear disregard of the law. To avoid a citation please ensure you are following the traffic laws. To review the Code of Georgia click here. Is the police department involved in community activities? Absolutely! We are fully invested in our community and wish to remain engaged with all of our citizens. We are available to talk at your next meeting. We attend community functions as often as possible. We take part in charity programs and events. During the holidays you just might find us delivering gifts to those in need. We are committed to our community! Is it against the law to film the police? As long as you are not interfering with a law enforcement officer in the performance of their duties and you are in a public place, on your own property, or on private property with permission from the owner, you may film the police in the performance of their duties. What unique value does the police department bring to the community? The Graham Police Department provides our community with increased law enforcement visibility. Marked patrol cars in our city serves as a deterrent to crime. Our own police force allows us to respond quickly to emergencies when a Deputy could be far off in another area of the county. Our Officers develop personal relationships with our residents and tailor services to meet your specific needs and the needs of our community at large. Local community control means we answer to our city residents. The Sheriff, on the other hand, is elected to serve the entire county and ultimately answers to all voters in the county. We perform these services for the citizens of Graham in a cost effective manner that reduces crime and increases public safety. Are police required to obey traffic laws also? Georgia law provides for certain exemptions from traffic laws for authorized emergency vehicles under certain circumstances (See OCGA 40-6-6). If you observe an Officer disobey traffic laws please understand that the Police Officer might be responding to an emergency situation or is in pursuit of a suspected violator of the law. Officers must always practice due regard for the safety of the public. If you have a concern about a Graham Police Officer's driving, you may contact us at (912) 367-6900 to discuss the matter or you may follow our complaint procedures as listed above. Are safety checkpoints legal & do I have to comply with the Officer's requests? Yes. Both the United States Supreme Court & the Supreme Court of Georgia have upheld the Constitutionality of Safety Checkpoints. (See City of Indianapolis v. Edmond, 531 U. S. 32 (2000) and Michigan Dep't of State Police v. Sitz, 496 U. S. 444 (1990). Failure to comply with the Officer's lawful requests could result in arrest for Obstruction under OCGA 16-10-24(a). All Safety Checkpoints are supervised by the Chief of Police; All passing vehicles are checked; Police uniforms, lights, and signs are clearly displayed; Published in advance on police social media website; Minimal delay to motorists unless a violation is observed by law enforcement. What is a Graham Police Officer's authority and Jurisdiction? A City of Graham Police Officer is a sworn Peace Officer with full powers of arrest. 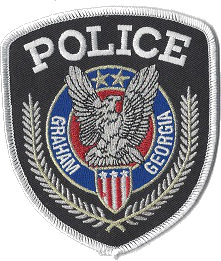 Peace Officers may serve arrest warrants anywhere in the State of Georgia and enforce the law within the geographical boundaries of the City of Graham. Outside the boundaries of the City, an Officer could be granted arrest powers through mutual aid agreements during emergencies, deputization, or by virtue of citizen's arrest law (OCGA 17-4-60). Also, under the "hot pursuit doctrine" an Officer who witnesses a violation in his/her jurisdiction, may immediately pursue the violator outside their jurisdiction to affect an arrest. Do you provide criminal history or fingerprint services? The Graham Police Department can provide criminal history information as permitted by law. The fee for this service is $20.00 per request. An online search for felony records is available for a fee through Georgia Felon Search We do not provide fingerprinting services.